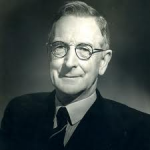 Charles Edwin Woodrow Bean was born in Bathurst, New South Wales, on 18 November 1879 – we have just passed the 133rd anniversary of his birth. C.E.W. Bean is perhaps best known as the author of the multi-volume Official History of Australia’s participation in the First World War. Through both his war-related writings, and through a number of accounts of his travels in Australia, he played an active role in recording and shaping the Australian lexicon. After attending Oxford and taking up the law for a short period of time, Bean become a journalist with the Sydney Morning Herald in 1908. Travelling around New South Wales, he wrote a series of articles which were turned into books. On the Wool Track (1910) was an account of the wool industry in Australia, and provided detailed accounts of the daily life on sheep farms; The Dreadnought of the Darling (1911) was an account of life and trade on the Darling River. Bean’s accounts of rural New South Wales provide the Australian National Dictionary (1988) with a great deal of evidence for Australian terms. 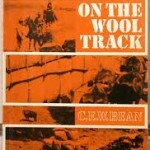 On the Wool Track includes evidence for terms such as: cocky ‘a small farmer’, to dog ‘to hunt dingoes’, poison-cart ‘vehicle that lays poison to exterminate vermin’, ration bag ‘a bag for rations’, sweeper ‘person employed to sweep up wool during shearing’, snig ‘to haul a log by means of ropes and chains’, and snow lease, ‘a contract governing the tenure of an area of Crown land in the snow country’. The Dreadnought of the Darling provides evidence for a range of terms including cocky’s joy ‘treacle’, dreadnought ‘a river boat’, jackeroo ‘a young man working on a cattle or sheep station’, outside country ‘remote country’, and portulac ‘pigweed’. Bean’s accounts of life in rural areas of New South Wales are important historical records about the social and working conditions of these areas. By recording some of the language relevant to these areas, he provides valuable evidence for the history of Australian English. In next week’s blog, I will look at Bean’s use of Australian English in his writings about the First World War. This entry was posted in ANDC, rural Australia, writers and tagged Australian English, C.E.W. Bean, cocky, cocky's joy, Darling river, dog, dreadnought, jackeroo, NSW, outside country, portulac, posion-cart, ration bag, rural Australia, shearing, snig, snow lease, sweeper, wool industry by Amanda Laugesen. Bookmark the permalink.